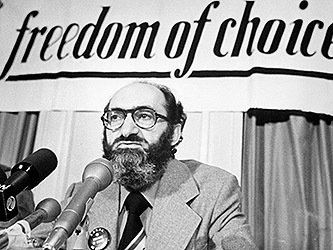 Dr. Henry Morgentaler, who passed away on May 29, 2013, was a freedom-of-choice advocate who protected the Canadian Charter of Rights and Freedoms and International Human Rights by successfully challenging an unjust and unconstitutional law in 1988 that imposed restrictive burdens on pregnant women seeking abortions. Dr. Morgentaler was honoured with the Order of Canada award in 2008 for his commitment to women's health care, and influence in Canadian public policy for advancing freedom of choice for women, humanism, and civil liberties. After the Supreme Court of Canada ruled that abortion is legal in Canada, Dr. Morgentaler continued opening more abortion clinics throughout the country and organized high-quality medical training programs to ensure patient safety. A few provinces enacted laws and regulations that outlawed abortion, but Dr. Morgentaler appealed to the courts again to have them overturned. In particular, the New Brunswick Provincial Government, which refused to pay for abortions, argued using sexist discrimination that only women who needed to use abortion clinics actually had the right to challenge abortion policies, but the New Brunswick Court of the Queen's Bench ruled that Dr. Morgentaler had standing to challenge the policies and had the right to file a lawsuit against the government because of the personal and time-sensitive nature of abortions (e.g., pregnant women have a limited time-period in which to get an abortion). Anti-abortion violence perpetrated against Dr. Morgentaler and his clinics included countless written and verbal death threats, physical assaults, attacks with dangerous weapons ranging from knives to garden shears to guns, bombs and firebombs, fireworks, arson, etc. In some cases neighbouring facilities were nearly destroyed, including the Toronto Women's Bookstore, and abortion doctors eventually had to resort to wearing bullet-proof clothing when anti-abortion assassins began shooting at medical staff (nurses, doctors, etc.) with rifles and small arms. For his efforts and accomplishments, Dr. Henry Morgentaler has earned many prestigious honours and awards, including the Order of Canada, from a wide variety of organizations, mainly because his impact on Canadian laws has helped tremendously to ensure that constitutionally-protected personal freedoms are not eroded.